As part of the ongoing dialogue on Nkrumah and the CIA, a contributor pointed our attention to this piece by Paul Lee. Declassified National Security Council and Central Intelligence Agency documents provide compelling, new evidence of United States government involvement in the 1966 overthrow of Ghanaian President Kwame Nkrumah. The coup d'etat, organized by dissident army officers, toppled the Nkrumah government on Feb. 24, 1966 and was promptly hailed by Western governments, including the U.S. The documents appear in a collection of diplomatic and intelligence memos, telegrams, and reports on Africa in Foreign Relations of the United States, the government's ongoing official history of American foreign policy. Prepared by the State Department's Office of the Historian, the latest volumes reflect the overt diplomacy and covert actions of President Lyndon B. Johnson's administration from 1964-68. Though published in November 1999, what they reveal about U.S. complicity in the Ghana coup was only recently noted. Allegations of American involvement in the putsche arose almost immediately because of the well-known hostility of the U.S. to Nkrumah's socialist orientation and pan-African activism. Nkrumah, himself, implicated the U.S. in his overthrow, and warned other African nations about what he saw as an emerging pattern. "An all-out offensive is being waged against the progressive, independent states," he wrote in Dark Days in Ghana, his 1969 account of the Ghana coup. "All that has been needed was a small force of disciplined men to seize the key points of the capital city and to arrest the existing political leadership." "It has been one of the tasks of the C.I.A. and other similar organisations," he noted, "to discover these potential quislings and traitors in our midst, and to encourage them, by bribery and the promise of political power, to destroy the constitutional government of their countries." While charges of U.S. involvement are not new, support for them was lacking until 1978, when anecdotal evidence was provided from an unlikely source-a former CIA case officer, John Stockwell, who reported first-hand testimony in his memoir, In Search of Enemies: A CIA Story. Subsequent investigations by The New York Times and Covert Action Information Bulletin identified the station chief as Howard T. Banes, who operated undercover as a political officer in the U.S. Embassy. This is how the ouster of Nkrumah was handled as Stockwell related. The Accra station was encouraged by headquarters to maintain contact with dissidents of the Ghanaian army for the purpose of gathering intelligence on their activities. It was given a generous budget, and maintained intimate contact with the plotters as a coup was hatched. So close was the station's involvement that it was able to coordinate the recovery of some classified Soviet military equipment by the United States as the coup took place. According to Stockwell, Banes' sense of initiative knew no bounds. The station even proposed to headquarters through back channels that a squad be on hand at the moment of the coup to storm the [Communist] Chinese embassy, kill everyone inside, steal their secret records, and blow up the building to cover the facts. Though the proposal was quashed, inside the CIA headquarters the Accra station was given full, if unofficial credit for the eventual coup, in which eight Soviet advisors were killed. None of this was adequately reflected in the agency's records, Stockwell wrote. 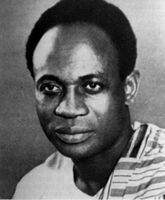 While the newly-released documents, written by a National Security Council staffer and unnamed CIA officers, confirm the essential outlines set forth by Nkrumah and Stockwell, they also provide additional, and chilling, details about what the U.S. government knew about the plot, when, and what it was prepared to do and did do to assist it. On March 11, 1965, almost a year before the coup, William P. Mahoney, the U.S. ambassador to Ghana, participated in a candid discussion in Washington, D.C., with CIA Director John A. McCone and the deputy chief of the CIA's Africa division, whose name has been withheld. Significantly, the Africa division was part of the CIA's directorate of plans, or dirty tricks component, through which the government pursued its covert policies. According to the record of their meeting (Document 251), topic one was the "Coup d'etat Plot, Ghana." While Mahoney was satisfied that popular opinion was running strongly against Nkrumah and the economy of the country was in a precarious state, he was not convinced that the coup d'etat, now being planned by Acting Police Commissioner Harlley and Generals Otu and Ankrah, would necessarily take place. Nevertheless, he confidently-and accurately, as it turned out-predicted that one way or another Nkrumah would be out within a year. Revealing the depth of embassy knowledge of the plot, Mahoney referred to a recent report which mentioned that the top coup conspirators were scheduled to meet on 10 March at which time they would determine the timing of the coup. However, he warned, because of a tendency to procrastinate, any specific date they set should be accepted with reservations. In a reversal of what some would assume were the traditional roles of an ambassador and the CIA director, McCone asked Mahoney who would most likely succeed Nkrumah in the event of a coup. Mahoney again correctly forecast the future: Ambassador Mahoney stated that initially, at least, a military junta would take over. But Mahoney was not a prophet. Rather, he represented the commitment of the U.S. government, in coordination with other Western governments, to bring about Nkrumah's downfall. Firstly, Mahoney recommended denying Ghana's forthcoming aid request in the interests of further weakening Nkrumah. He felt that there was little chance that either the Chinese Communists or the Soviets would in adequate measure come to Nkrumah's financial rescue and the British would continue to adopt a hard nose attitude toward providing further assistance to Ghana. At the same time, it appears that Mahoney encouraged Nkrumah in the mistaken belief that both the U.S. and the U.K. would come to his financial rescue and proposed maintaining current U.S. aid levels and programs because they will endure and be remembered long after Nkrumah goes. Secondly, Mahoney seems to have assumed the responsibility of increasing the pressure on Nkrumah and exploiting the probable results. This can be seen in his 50-minute meeting with Nkrumah three weeks later. According to Mahoney's account of their April 2 discussion (Document 252), "at one point Nkrumah, who had been holding face in hands, looked up and I saw he was crying. With difficulty he said I could not understand the ordeal he had been through during last month. Recalling that there had been seven attempts on his life." Mahoney did not attempt to discourage Nkrumah's fears, nor did he characterize them as unfounded in his report to his superiors. "While Nkrumah apparently continues to have personal affection for me," he noted, "he seems as convinced as ever that the US is out to get him. From what he said about assassination attempts in March, it appears he still suspects US involvement." Of course, the U.S. was out to get him. Moreover, Nkrumah was keenly aware of a recent African precedent that made the notion of a U.S.-organized or sanctioned assassination plot plausible-namely, the fate of the Congo and its first prime minister, his friend Patrice Lumumba. Nkrumah believed that the destabilization of the Congolese government in 1960 and Lumumba's assassination in 1961 were the work of the "Invisible Government of the U.S.," as he wrote in Neocolonialism: The Last Stage of Imperialism, later in 1965. When Lumumba's murder was announced, Nkrumah told students at the inauguration of an ideological institute that bore his name that this brutal murder should teach them the diabolical depths of degradation to which these twin-monsters of imperialism and colonialism can descend. In his conclusion, Mahoney observed: "Nkrumah gave me the impression of being a badly frightened man. His emotional resources seem be running out. As pressures increase, we may expect more hysterical outbursts, many directed against US." It was not necessary to add that he was helping to apply the pressure, nor that any hysterical outbursts by Nkrumah played into the West's projection of him as an unstable dictator, thus justifying his removal. On May 27, 1965, Robert W. Komer, a National Security Council staffer, briefed his boss, McGeorge Bundy, President Johnson's special assistant for national security affairs, on the anti-Nkrumah campaign (Document 253). Komer, who first joined the White House as a member of President Kennedy's NSC staff, had worked as a CIA analyst for 15 years. In 1967, Johnson tapped him to head his hearts-and-minds pacification program in Vietnam. Komer's report establishes that the effort was not only interagency, sanctioned by the White House and supervised by the State Department and CIA, but also intergovernmental, being supported by America's Western allies. "FYI," he advised, "we may have a pro-Western coup in Ghana soon. Certain key military and police figures have been planning one for some time, and Ghana's deteriorating economic condition may provide the spark." "The plotters are keeping us briefed," he noted, "and the State Department thinks we're more on the inside than the British. While we're not directly involved (I'm told), we and other Western countries (including France) have been helping to set up the situation by ignoring Nkrumah's pleas for economic aid. All in all, it looks good." Komer's reference to not being told if the U.S. was directly involved in the coup plot is revealing and quite likely a wry nod to his CIA past. "The coup in Ghana," he crowed, "is another example of a fortuitous windfall. Nkrumah was doing more to undermine our interests than any other black African. In reaction to his strongly pro-Communist leanings, the new military regime is almost pathetically pro-Western." In this, Komer and Nkrumah were in agreement. "Where the more subtle methods of economic pressure and political subversion have failed to achieve the desired result," Nkrumah wrote from exile in Guinea three years later, "there has been resort to violence in order to promote a change of regime and prepare the way for the establishment of a puppet government." Paul Lee is a historian, filmmaker, and freelance writer. He is Director of Best Efforts, Inc. (BEI), a professional research and consulting service that specializes in the recovery, preservation, and dissemination of global black history and culture. BEI offers "OurStory," a black history lecture series. You can reach him at besteffortsinc@yahoo.com. © 2001-02 Copyright Seeing Black, Inc. All Rights Reserved.